In 1880, Shackelford County was only six years old. Albany was a village with a picket courthouse, no railroad, and not a wire fence in the county. Fort Griffin was still an army post and the Tonkawa Indians had recently camped in the streets. On February 22nd of that year, the Presbyterian Church of Albany was organized. The church began with only seven members, who met in the first little rock house on Jacobs Street. The first elders of the church, Henry and John Jacobs, owned most of the land south of the line which was later the railroad and gave the lot for the first church building. 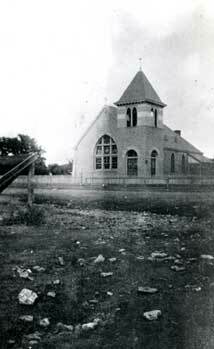 It was a small frame structure, painted white with a small spire, and was situated on the corner across the street west of the present building. In the early 1890s, families began moving from the country to town to put their children in school. Having outgrown the little church, the present stone structure was erected in 1898 in memory of one of Shackelford County’s first cattlemen and one of the early elders of the congregation, Joseph Beck Matthews (1824-1895). The original sanctuary was arranged in the “Akron plan”—three sections of curved pews on a sloping floor, with no center aisle. The area containing the south anteroom and most of the present chancel formed a separate room which could be made part of the main church by opening accordion doors. The first pipe organ was in a chamber, converted from the original pastor’s study, in the northeast corner. The choir and pulpit platform were just west of it next to the two forward windows on the north side. The educational building was constructed in 1927 and in 1954 the church was remodeled under the leadership of Watt Matthews. Architect for the remodeling, Joseph E. Blanton, lowered the entrance and leveled the floor so that there are now only two steps from the ground to floor level Seating was changed to two sections of straight pews with one center aisle. The stone of the floors was quarried and cut at Lueders and much of it was laid by the men of the church. The present organ was installed when the sanctuary’s interior was remodeled in 1954. The organ was given in memory of Caroline Spears Matthews (1828-1924), wife of Joseph Beck Matthews, by her descendents. Mrs. Matthews was one of the early pioneers of this area. A woman of rare courage and great strength of character, she helped establish Christianity on the frontier. 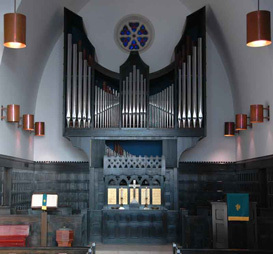 The pipe organ was built by Otto Hofmann of Austin, Texas, who had the pipes and pedal chests made by Flentrop Orgelbouw of Zaandam, Holland. Mr. Hofmann also made use of the manual windchests, keyboards, and other parts from a Hinners organ built for the First Methodist Church in New Braunfels, Texas in 1910. The case, built by the Bascomb Church Furniture Company, was designed by Joseph E. Blanton, architect for the remodeling. This was the first modern tracker organ in the United States to be permanently installed in a contemporary case. The organ was dedicated on November 10, 1956, with a recital by Donald Willing, a professor at the New England Conservatory of Music in Boston, Massachusetts. In 1985 the organ was modified to add three stops, made in England and Germany, bringing the total number of pipes to 1,476. 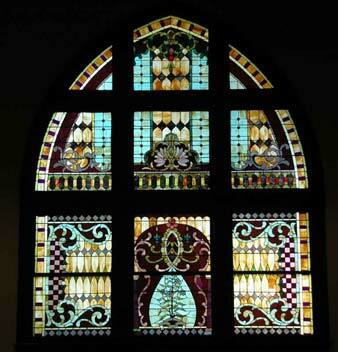 The glass in the lunettes and round windows over the organ was all cut and leaded in Albany by Joseph E. Blanton and Elmer Smith with help from others in the church. The baptismal font was designed by architect Joseph E. Blanton in memory of Sallie Reynolds Matthews. 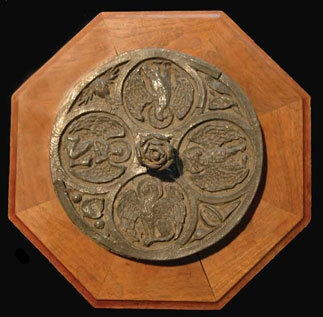 The lead lid, made by Blanton, includes the symbols of the four Gospels. The handle, a cactus blossom and other floral forms, are symbolic of this ranch country and Mrs. Matthews’ love and knowledge of our wild flowers. The wooden base with the memorial inscription and dates was made in Richmond, Virginia by Biggs Furniture—famous for their true copies of antiques. 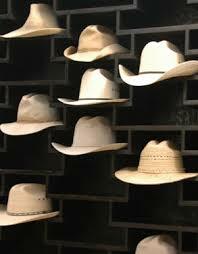 The unique hat shelf is located in the narthex of the sanctuary. It’s simple, creative design is one of the most popular fixtures in the church.